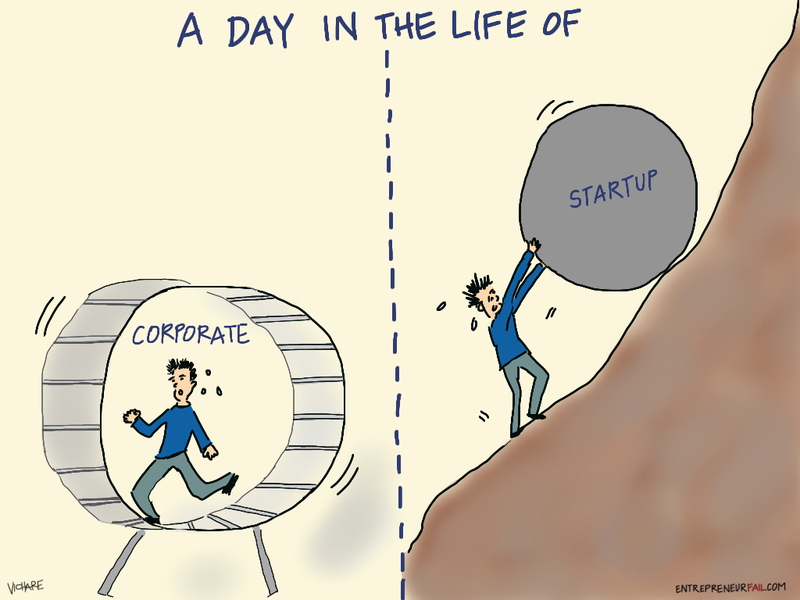 "Cheating on Your Corporate Job: A Comic Look at the Startup Dream"
Psssssst. Hey you! Yes, you… the one reading this. We know who you are. The kind of person who is just itching to make the leap from your cushy (or maybe NOT so cushy) corporate job into the world of startups. You know what? We don’t blame you one bit. Because there is something to be said about living your passion, earning money doing it and making decisions with no one but yourself to answer to. Of course, there’s also the long hours, scouring the planet in search of customers, and sometimes, eating leftovers from the leftovers from last week. And surely SOMEONE told you it wouldn’t be as easy as starting a business then becoming a multimillionaire overnight. Right? RIGHT? Hmmmm… we need to have a talk. Whenever we speak to entrepreneurs who have left the corporate rat race to pursue their own ventures, their experiences always echo our own. Sure, new small business owners expect more ownership, additional flexibility, less bureaucracy and longer hours. However, the biggest surprises will probably involve job satisfaction, getting a product to market, and organizational structures. Our goal is to create a way for you to look at the inside from the outside, to help you decide whether or not this is the road you want to take or if you’d rather stay at your job, sleepwalking through your days and blowing drool bubbles as you watch the clock slowly tick away to 6 PM. But in all humility, and jokes aside, we respect that in the end, you – and only you – can decide which path is right for you to take. Knowledge and preparedness is power. Download our book: "Cheating on Your Corporate Job: A Comic Look at the Startup Dream" to help you decide where you belong. Enjoyed this comic? You may love this one too.